There are plenty of literary festivals around the world for university professors, but the O, Miami Poetry Festival is for everybody. This year’s celebration will be the eleventh anniversary of carrying out their mission for every single person in Miami-Dade County to encounter a poem. Don’t let them down. O, Miami is different from the usual music and film festivals. You don’t have to buy expensive tickets or use up your vacation time taking a week off of work to attend. Almost all the events are free and suitable for all ages. They take place all across Miami-Dade County, with an emphasis on traditionally underserved communities. You can participate in creating many of the activities or see them while you’re going about your daily tasks. There are traditional readings and workshops, but much of the excitement comes from unusual adventures that bring poetry into spaces where you would rarely see it otherwise. In the past, that’s meant things like writing poems on the sides of buses or on banners trailing behind planes flying in and out of Miami International Airport. There have been puppet shows, kayaking trips, and audio versions of poems hidden inside special 3D seashells on the beach. There have even been activities for four-legged creatures. The Dogleggers, based on the more familiar Bookleggers mobile book exchange, has handed out bandanas with selections from Emily Dickinson for the discriminating dog. There’s also been an actor dressed up as Jose Marti, the legendary Cuban poet and revolutionary. He rode down Eighth Street on a white horse broadcasting his verses through a megaphone and handing out white roses to passersby. Given that some people still have bad memories of poetry that they were forced to read in school, the projects include advertised events that people deliberately sign up to attend and projects that sneak poetry into settings where people don’t expect it, like when they’re waiting in traffic or visiting a barber shop. Specific details vary from year to year, but you always have plenty of options to choose from with an average of 41 events and 23 projects being co-produced annually. Are There Any Famous Poets Coming? The people of Miami are the main attraction, but the Festival does have an invitation-only visiting poets series. Some of the artists who have been hosted in the past include Anne Carson, Kay Ryan, Juan Felipe Herrera, W.S. Merwin, Raúl Zurita, Kevin Young, Robert Hass, Patricia Smith, Antibalas, Manual Cinema, Martine Syms, Sonya Clark, Thurston Moore, Richard Blanco, Tracy K. Smith, Megan Amram, Kool Moe Dee, Hanif Abdurraqib, and Reina María Rodriguez.O, Miami also has a publishing imprint under the name of Jai-Alai Books that publishes poetry on an occasional basis. While the Festival ends on April 30 each year, there are plenty of other things going on year round. Check their website and follow them on Facebook to keep up with ongoing events. They’re always looking for volunteers. The need for readers is limited given the unconventional approach they take to poetry, but there are many fun and rewarding ways to get involved. As far as the Festival itself, they gather suggestions from the public for what to do each year starting in the fall when the Project Proposal period opens in September. Don’t let the creativity of previous years intimidate you. Everyone is welcome to join in finding ways to help build community and connections. The founders like to say that the poetry is secondary to the focus on Miami itself. They also like to say they’re more about discovering the poetry that’s already out there instead of having to make it themselves. How Can I Help Support O, Miami? In addition to volunteering your time, you can make cash and in kind donations. O, Miami is a 501(c) (3) nonprofit and donations are tax deductible. One major inspiration for O, Miami was the Random Acts of Culture project launched by the John S. and James L. Knight Foundation of Miami. They surprised people with classical performances in supermarkets and other unlikely places. Sometimes it was a great success moving people to tears, and sometimes the performers just got yelled at to stop blocking the aisles. Still, it’s all worthwhile in bringing poetry and other classical arts to new and diverse audiences, and showing that the arts are for everyone who has a heart. The Knight Foundation is still the primary sponsor for O, Miami. Additional support has been provided by Miami-Dade County, City of Miami Beach, Culture Builds Florida, The Children’s Trust, Poetry Foundation, The Miami Foundation, and other generous individuals and organizations. 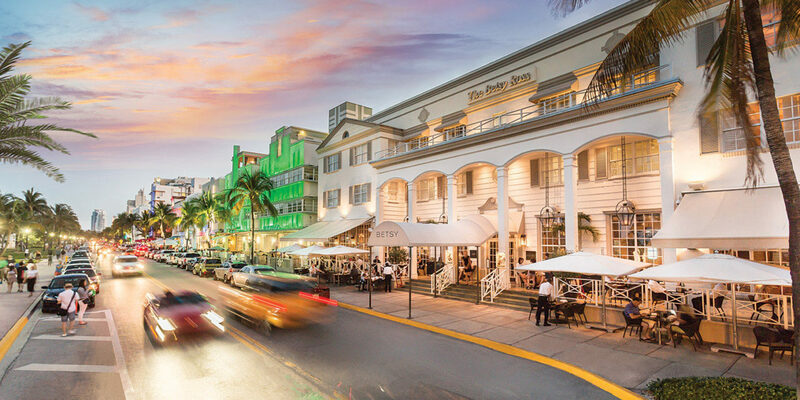 For 2019 the host hotel is The Betsy-South Beach, and the official festival bookseller is Books & Books. The Betsy South Beach is one of only three Florida hotels on the 2017 Conde Nast Traveler Gold List Award and offers spectacular views and amenities in addition to their commitment to the arts. They’re also an official partner for Art Basel Miami Beach. Books & Books in Miami Beach opened in 1989 as the second store following the success of their flagship shop in Coral Gables. They specialize in art, design, fashion, and architecture, and you can visit them in the historic Sterling Building in the heart of South Beach. How Come O, Miami is In April? That’s because April is National Poetry Month. The tradition started back in 1996 as an initiative of the Academy of American Poets. It’s now grown into the largest literary celebration in the world. If you’re still looking for more inspiration, visit their website for 30 more ways to celebrate in April, including getting a free copy of the official poster, available through mid-April. O, Miami is a great way to celebrate all that’s beautiful and poetic about our city. At Flamingo Appliance Service, we have over 30 years of industry experience, and we’re proud to provide fast and reliable service in Florida and Georgia. Contact us today to book your repair.